This Sunday we take a look at two images from the amazing Michael Wm. Kaluta! 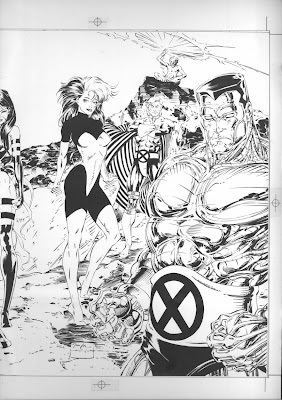 This image is from The Uncanny Dave Cockrum Tribute book. I really dig the ying/yang Nightcrawlers in the center of Storm’s lightning tinged fingers. Storm’s face has a more androgynous look here, her nose is a bit more Greco-Roman and her lips have a more pronounced curve to them (especially the upper lip). Her cheek bones are higher and her chin has a bit more prominence, giving Ororo a more classical look. Also, notice how her tiara is depicted much smaller than usual above the forehead, but it extends in front of her ears to her cheekbones. Though Storm is prominently featured in this image, the focus is really on the double Nightcrawlers, who look more demonic than ever. By giving them more realistic anatomy and hunched, almost fetal-like posture, Kaluta has emphasized Kurt’s (the Kurts’) otherworldly mutant nature. 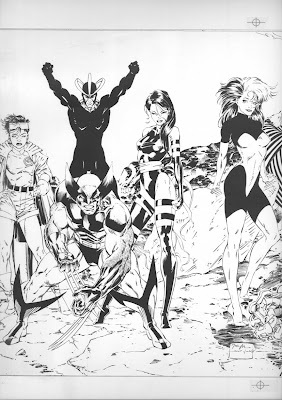 The realistic drawing style, combined with the metaphorical imagery makes Marvel’s mutants look rather mystical. Speaking of mystical natures, here’s Zatanna “conjuring a storm” by Kaluta. I’m not sure if it is intentional or not, but Storm’s detailed hands with their long sharp nails and her rather angry face remind me of Ororo’s time as a thrall to Dracula. My intuition tells me that Kaluta probably just wanted to draw her full of weather witch intensity. She definitely looks ticked off! This image is a nice DC/Marvel crossover moment as well as a cute pun and it’s always great to see Zatanna! iFanboy‘s describes Cameron Stewart’s art book as “a 48-page, vibrantly colorful hardback collection of unpublished and never-before-seen pin-up illustrations, many created specifically for this edition. Also available will be WARM-UPS, Cameron’s 2008 Sketchbook (softcover,black and white), a mix of complete illustrations and rough process drawings further showcasing his single-track obsession with cute females.” You can purchase the artbook here! Just scroll down until you see the cover I have reproduced in the middle of this post. The first volume of The Apocalypstix, written by Ray Fawkes, illustrated by Cameron and published by Oni Press is now available! Get your copy today! Also, keep an eye out for Seaguy: Slaves of Mickey Eye by Stewart and written by Grant Morrison. Check out Cameron Stewart’s site here and stalk him on MySpace here. Read the Wikipedia entry on him here and learn all about his Eisner-nominated series The Other Side he created with writer Jason Aaron. Cameron drew this GORGEOUS rendering of punk rock mohawk Storm on the last day of Comic Con in spite of being exhausted and overworked. I am forever grateful to him for this piece which is a scintillating gem in my collection of Storm drawings. 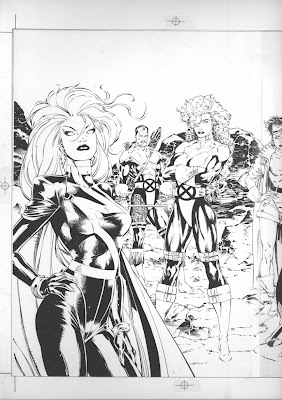 I love the soft yet powerful eyes of Ororo in this drawing. The details of light on her nose and collar studs are great touches. What about those perfect lips?! And that mohawk is beautiful! I’ve simply run out of adjectives to adequately describe how happy this artwork makes me. Thanks, Cameron! This is the cover of the artbook you need to purchase here. One of my favorite images from the aforementioned artbook. I love how Cameron is able to give his women a streetwise flair for fashion. Besides selling his artbooks and attending signing after signing, Darwyn announced his new project: adapting the “Parker” series crime novels by Donald Westlake (under the pen name Richard Stark) as a series of four full-length graphic novels for IDW Publishing. IDW’s official press release is here. Comic Book Resources and Newsarama (among many, many others) also have more information. Artwork from Justice League: The New Frontier graphic novel. The cartoon movie adaptation of this work has been nominated for an Emmy! My favorite image from Retroactive is a scene from Justice League: The New Frontier. I was very happy to see it represented in the art book! This image of Green Lantern and Carol Ferris invokes a sense of wonder that I always get when I look at Darwyn Cooke’s work. You can see a partial bibliography list of Darwyn’s work here. Dunno how accurate it is since it’s Wikipedia. I definitely recommend his amazing work on The Spirit, especially the Batman/Spirit one-shot. If you’ve been reading Ghost Rider lately you might know about Jason Aaron, one of comicdom’s rising writiers. Or you might know him from Scalped, the ongoing Native American crime series by Vertigo Comics. Or you might have read some issues of Wolverine by him or maybe you’ve read the first issue of his three issue Secret Invasion stint on Black Panther. I sincerely hope, dear reader, that if you are unfamiliar with his work that you seek it out and support this amazing writer (especially Scalped, it’s truly gripping). Jason was also nominated for an Eisner for his work with Cameron Stewart on the Vietnam War mini-series The Other Side. I got the opportunity to chat briefly with Jason at the San Diego Comic Con and being a good sport, he not only signed my sketchbook for me, but he also drew this funny Ghost Rider/Punisher cartoon! Thanks, Jason! Check out Jason Aaron on his site here. Stalk him on MySpace here. Now go pick up a copy of Scalped. Now! The day before I left for San Diego Comic Con, I shared a bit of art by the amazing Joshua Middleton, but little did I know that I would get the chance to meet the man himself! Below is a sketch he drew for me of the character Adam from Steven T. Seagle and Becky Cloonan’s American Virgin (Vertigo Comics). Joshua’s site is here and you can learn about American Virgin here. This is the cover that Joshua drew that made me fall in love with the character. Of course, once I read an issue I fell in love with Becky Cloonan’s drawings of him as well! Go get American Virgin from your local comic book dealer! Thing is, I used that cover as a focus for a story I was writing in graduate school since he somewhat resembled the main protagonist. I must have stared at that image on my wall for at least two years (I bought two copies of the comic and ripped off the cover of one to hang up)! So, it is a great treasure to have an original drawing of the character who inspired so many late night writing sessions! Thanks, Joshua for an amazing sketch! Look at those soulful eyes! This is a character who obviously thinks deep thoughts (and has great hair to go with a big brain). You know what really frustrates me? When I mention comic book superstars to my non-comic reading frineds and they say, “Who?” That drives me bonkers. It’s like what can I do? Shove comics in their hands? Plant them in their houses? Give them as presents for their birthdays? Anyway, I came back from San Diego Comic Con totally blissed out and my non-comic reading friends were all like, “What happened to you? Who did you meet?” And when I mentioned Grant Morrison, their faces went blank with ignorance. I mean, GRANT MORRISON! It’s ridiculous. So, at a signing at the Darwyn Cooke, Cameron Stewart and Dave Bullock booth, I got to be elf to Grant Morrison’s Santa Claus (It’s a lot less sordid than it sounds, unfortunately). I ushered fans in and out of the booth as they chatted up Grant and got him to sign their copies of Seaguy, JLA, X-Men, Final Crisis, Batman, The Invisibles, Animal Man, etcetera. Beforehand, Grant and I had five minutes to talk about Lord Fanny, drag, magic (particularly sigils) and the power of intuition. Definitely the most amazing five minute conversation I’ve had in a long time! In addition to dispensing wise counsel to all who visited the booth, Grant kindly signed my sketchbook and drew me this sweet sketch of Batman! Give Grant’s newly updated site a visit! I most definitely recommend you read his POP MAG!C section! Also, check out this Publisher’s Weekly interview with Grant! While working at the Darwyn Cooke, Cameron Stewart and Dave Bullock booth at this year’s San Diego Comic Con (more on that soon, I promise), I got the chance to meet Jimmy Palimiotti! Jimmy’s a man of many talents and projects and is a well known writer, editor and creator. You can check out his official bio here (along with the super-talented Amanda Conner and the illustrious Justin Gray). Jimmy’s wikipedia entry is here and after you check out the work he’s done and order his books from your local comic dealer and watch Painkiller Jane on the SciFi channel, you can stalk him on MySpace. I really enjoyed my brief chat with Jimmy as he hung out with the artists of Booth 2207 and was especially delighted when he graciously agreed to sketch this portrait of the Punisher for me. Frank’s looking grim and gritty in this piece, just the way I like him! Gotta love the stubble, the jacket collar and that raised eyebrow. I think this drawing really encapsulates the rough and rugged emotional character of Frank Castle! He’s a potent combination of handsome and dangerous! Much gratitude to Jimmy for this great sketch! While I do have lots more amazing drawings from San Diego Comic Con 2008 to share with you, dear reader, I thought it would be cool to first share this amazing Storm drawing that artist Mark Robinson was so kind to draw for me at this past Wonder Con! I’d love to promote Mark’s upcoming work, but didn’t find a site for him when I Googled his name. If you know where Mark Robinson can be found on the web, please drop me a line and let me know!